what a great idea, an edge that pushes the salsa back on the chip. The links you posted just take you to a pic of the FB logo?? No, Chandler Bing, IT COULD NOT. You rock, Girl. I hope my crazy life slows down. I miss you! Love the bowl cause I love me some salsa. So tell me MS. JennyM what are you going to do with this army of followers? Are you fomenting revolution and gathering troops to go an live and train in the urban jungles filled with man caves and television sets? Are you going to make football (American) the new national religion with your salsa bowl inducements. Viva La Salsa! I don't fit any of the criteria for an entry so I guess you could say I am a counter revolutionary! Viva La Literati! Allrighty, following you and hoping you will share your salsa and/or guac recipes! That thing is flipping sweet! Love it! And totally cute too. Great color! My husband is always teasing me because I push the salsa out of the bowl and onto the table...or floor. What a fabulous idea! I have been following you here and liking you on FB. I like Salsabol on FB now too! Ha! Chandler Bing. I am a follower and thanks for helping with a birthday gift for my sister! Oh, and I hope to win one of these for myself. Have a great weekend! P.S. Thanks for reminding me I need to check on my fantasy football team before the weekend! Mmmmm... salsa. I love that bowl! Hope you have a happy Friday! I would love that salsa bowl! I would love the bowl, and I'm a follower! What a great idea, I think I need this now! I "like" LHAC on FB. That thing is cool looking--look forward to the recipes...Chandler Bing! not expecting to win anything..just wanted to tell you that I am buying one of these bowls.they are totally cute and cool. Cool bowl. I follow you on GFC. My family is all about the sports, and the food that goes with them. The buffalo dip sounds super YUMMY! I also follow LHAC on FB. Ohhhh I make Buffalo Chicken dip too! And it's AMAZING and totally addicting and terribly, terribly awful for you. Can I come to your superbowl party? Sweet. Great idea. I'm heading to Twitter right now to promote it. Happy Friday. I am a public follower :) YEA I hope I win! I like salsabowl on FB!! Yummy I can't wait to try the bowl out! I like LHAC on FB! I love the Salsabol and I can make something amazing to put in it. Likey on FB and you know how I bug you here! Tom here, of Michael and Tom, of the Salsabol. Thanks so much for your support, everyone! We have become huge fans of JennyMac throughout the process of getting together this giveaway, which we're all stoked about. 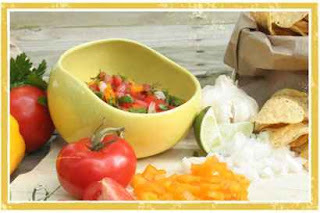 Some of you guys have mentioned that you have salsa recipes and great ideas for salsabol dips etc. We would to hear about those! 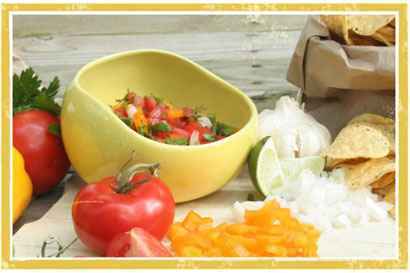 We are lacking in the homemade salsa recipe dept, and we would love to feature all of these recipe ideas on our blog, giving you your much deserved chef credit via a link to your blog, or your name ( or anonymously as well of course, if you prefer that). Just send us a quick email at theguys@salsabol.com, and we'll get right back to you about getting your recipe on the salsabol blog! Anyway, thanks again to everyone for their support. We're in the business of salsa and gratitude--so cheers to all you guys, and to JM. I a sucker for inventive serving ware--so neat! I follow, and simply love what creative people come up with...genius!!! Because people like to say Sal-Sa! and Could it BE any funner to win a contest. You got Seinfeld and Friends into a few last lines in one post. Bravo! Oh and I follow and will tweet and I like too. Dang! Why didn't I think of that! And I agree, a football game, without analysis pre or post would be just fine. Jeez, and they think we chicks talk too much! Have a wonderful weekend JennyMac! Try out that dip recipe and share it, will ya? Genius! And there is nothing better in life than salsa. Except maybe this prodcut? Gdamn, why didn't I think of that?? Tho if I did, I would have just used it to shovel more spicy salsa into my gaping maw. I was sure I followed you but my picture isn't above your followers. Then I tried to follow again but it said I already do. In case you didn't understand from my two previous comments--I really need and want that bowl! A perfect salsa bowl and a Friends reference? Now that is a perfect post! Oo! Oo! Pick me! Pick me! oh i want in cause we got that diease as well...smiles. That is a cute bowl...My little girls always get Salsa everywhere...Sorry I haven't been around much...I have been busy failing math...LOL! I'm a follower. That Salsa bowl is awesome! Football season is the ONLY season! I'm going to try this salsa for sure. Cool bowl...and I've watched 3 football games today. As a matter of fact, we had to eat dinner early because (mom and I) wanted to watch a game. As a matter of fact #2, I'm watching game #3 right now, (on mute so I can read without distractions). well nothing beats treats , snacks for football games. LOVE LOVE football. I am a footballasaurasbabealishus...got that?? So not a sportsaholic... but have many uses for that awesome bowl - how smart are they???? I follow you on Twitter! What a neat idea---love it! That is pretty genius. Why did it take so long?! What a fabulous idea! I am follower & I follow you on Twitter. i am commenting and a public follower. That IS a pretty clever idea. I make some pretty amazing guac too, and I like to put a ridiculous portion on each chip. Yum! I liked Salsabol on FB. What an awesome bowl! I follwo with GFC. I like LHAC on facebook. I follow you on twitter (I'm @scbrown929). Ooh, I hope I'm not too late to enter :) What a great idea!